This past weekend I made a quick 24 hour trip to Chicago for an audition on Saturday afternoon. After the audition I met up with my good friends from high school that now attend Northwestern University. I was crashing at their apartment for the night. Connections are key at this time of year too. Not only will it help you get you more quickly noticed at an audition, but if you know a friend in a city you are traveling to, staying with them considerably cuts down on travel costs. Thanks goodness for friendly friends! Anyway, After the audition we went into downtown Chicago, bought a few things at a record store and had a delicious meal at a Mexican restaurant: Buena Vista. It was a teeny tiny little restaurant. 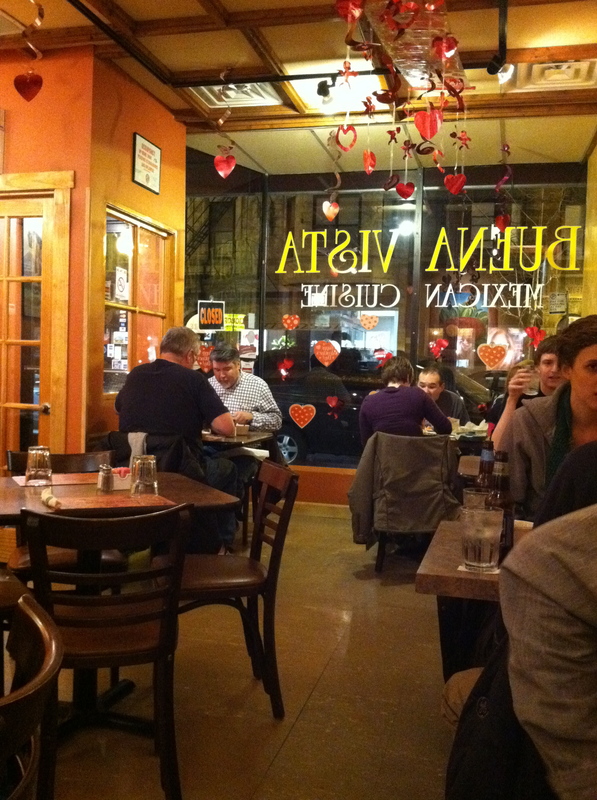 The dining area was incredibly small, the legal maximum occupancy was only 19 people to just give you an idea. The kitchen was almost the same size as the restaurant. To get to the restroom, I had to walk through the kitchen. I can’t say that is highly comforting as a diner (someone could misbehave on their way back to pee) but at the same time it was pretty fun to see a behind the scene look at this small family run restaurant. When we walked in the owner’s family (I’m assuming) was sitting at a table near the kitchen finishing up their meals and speaking rapidly in Spanish. If I owned this place or knew the owner I’d be eating here every night too. The food was simple yet delicious. right after we sat down we were brought two homemade salsas, one regular and one green, and a bowl of homemade chips. We then ordered some guacamole to munch on too as we picked our entrees. 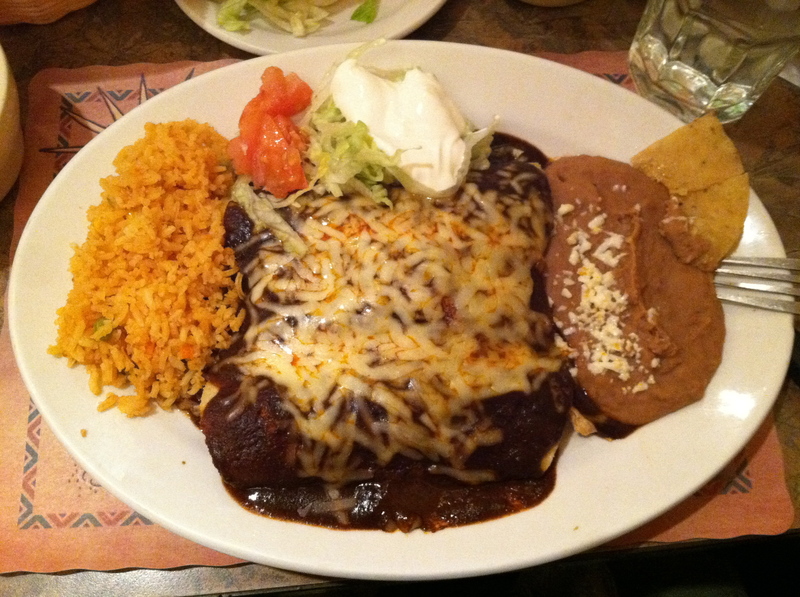 I decided to go with the enchiladas de mole. Steaming, they came out sandwiched between some refried beans and seasoned rice. Every individual part of that meal was delicious. The enchiladas were filled with incredibly tender chicken. There was not much more to the meal than what met the eye but there didn’t need to be. It was so deliciously simple and comforting that I was for the moment distracted by how much my mouth was burning from the spice. I finished off my time in Chicago with some quality college entertainment (you know) and then left to fly home the next morning. Once I returned home it was time to prepare for the Superbowl! I landed around 3:30 so there wasn’t much time for me to cook before heading to a friend’s apartment to watch the game but I of course wanted to contribute something. A few days before I was browsing through my Mark Bittman cookbook “The Food That Matters Cookbook” and found a recipe for hummus. In the cookbook it takes the hummus one step further and instructs you on how to serve it hot. However since I was to be transporting my batch I just left it room temperature. I have been wanting to make my own hummus for years but I didn’t have a food processor or a blender. Now that I am back at home, the kitchen supplies at my disposal have been opening the doors to my culinary adventures left and right. With only a handful of ingredients and requiring only a total of 10 minutes to make this was one of the easiest and most rewarding things I have made in a while. By the time the game was over last night ALL of my hummus was gone. (There were only 4 of us there eating it.) I’m not sure I will ever go back to store-bought hummus. Here is the recipe, with a few adaptations I made. Give it a try! Put the chickpeas, water, garlic, olive oil, and tahini in a blender or food processor. Sprinkle with salt and pepper. Puree for a minute or two until the mixture is very smooth. Add the lemon juice and blend again until it is incorporated. At this point you can adjust it to your liking by adding more of any ingredient to change the taste, consistency, or both. I just kept taking little tastes and adding more of this and that until it tasted just the way I like it. In the cookbook, Mark Bittman gives recommendations of other ingredients to add like roasted red peppers and spices to change up the flavor of the hummus. Being the first time I made it I just stuck with the original flavor. Next time I think I’ll add something to kick it up a notch. Maybe some roasted garlic. Yum. I took it to my friend’s apartment with some pita and chopped veggies and like I said, it was all gone by the time I left. Hope it’s as successful for you if you decide to give it a try!